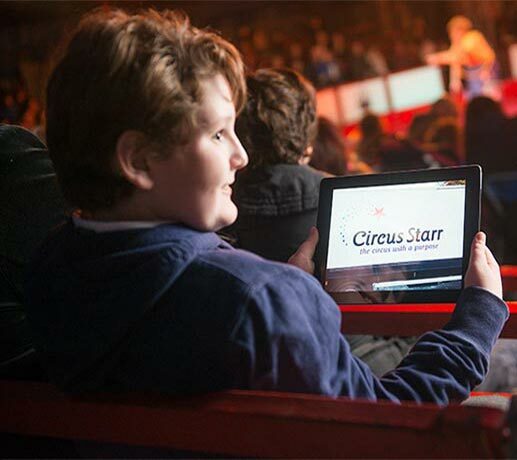 Our mission is to transform, enrich and inspire the lives of children and families who need it most through the magical art of circus performance. We’re delighted, therefore, to have been able to help blind and partially-sighted children to enjoy our Autumn shows as part of a new project. Funded by Big Lottery and the MFPA Trust Fund for Disabled Children in the Arts, as well as our own donated ticket programme, we’ve offered pre-show touch tours for visually impaired children. Following feedback from last year’s pilot, children were able to have a go at limbo dancing, swinging from the aerial silks and getting acrobatic on the crash mat with our performers on hand to help them. Meeting our entire cast and getting up close to the circus props, at performances in Nuneaton, Milton Keynes, Luton and Leicester our performances were also audio-described by Vocaleyes who provided live commentary delivered via headsets so that all of the details of the live circus action was enjoyed by all of our audience. We’re delighted by the feedback we’ve received and, as a result, we’re putting plans in place to acquire the equipment and training for our staff to be able to offer audio description on request throughout our tours. Inclusion is key; excitement is inevitable!